Roaring 40's Blue Cheese hails from King Island, located south of Melbourne at the Western end of Bass Strait. This small island in the Great Southern Ocean is one of the few remaining remnants of a land bridge that once linked the island of Tasmania to the Australian mainland. On a fine day, King Island is an exceptionally picturesque spot, but ferocious westerly winds which blow directly down 40°S Longitude can—and do—create treacherous seas. These winds came to be known as the Roaring 40's and they’re the basis for the mystique inherent in King Island's history. Hundreds of ships and thousands of souls have been lost in shipwrecks on its rocky shoreline. All around the island, you can find memorial cairns which tell about the lives of those shipwrecked, their brave rescuers, and the lighthouse keepers who worked tirelessly through many long nights. It was these very tragedies that gave the island its unique ambiance, and literally seeded the foundation upon which the island's dairy industry now rests. During the 15th and 16th centuries, as the Roaring 40's swept their fury across the trade routes causing shipwrecks, straw mattresses from many parts of the world drifted ashore. Their seeds germinated in the rich island soils and created the lush pastures that set the King Island dairy industry apart. The dairy herds graze on these verdant, dense pastures, supplementing their rich diet occasionally with a generous helping of kelp washed up after heavy storms. And so, King Island cows have become renowned for producing the sweetest, creamiest, purest milk—the basis of an array of fine dairy products and award-winning cheeses. King Island dairy products have long been acclaimed throughout Australia and they’re rapidly building extraordinary reputations in the international marketplace. Unlike typical French blue cheeses (e.g., Roquefort) made from ewe's milk, Roaring 40's Blue is made entirely from cow's milk. The result is a milder taste. Roaring 40's is a full-bodied blue with a honeyed, slightly nutty quality and great aftertaste. It is a rindless cheese, matured in wax, which helps it retain moisture and creates a smooth and creamy texture. A Roquefort style mold is used to create this singular and exciting cheese style. Roaring 40's Blue is a choice pick for connoisseurs with a penchant for sweet delights. Its flavor is greatly enhanced by pristine natural resources, unscathed by pollution and human encroachment. These advantages, along with the year round grazing season, complement traditional King Island cheesemaking recipes to create this famous, nontraditional Blue. 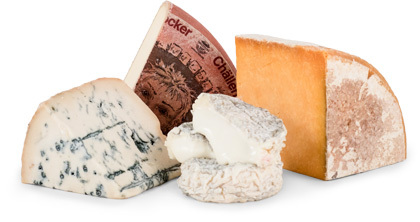 Roaring 40's Blue is recognized by the most prestigious dairy and agricultural institutions in Australia. 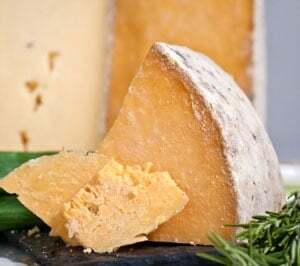 In 2002, it won "Champion Cheese" at the New York Fancy Food Fair, which is regarded as the most distinguished fair in the USA, attracting the finest quality products worldwide. Even if you're not a fan of blue cheese, with its buttery smooth, nutty flavor, Roaring 40’s may well win you over. It usually does. Allow the cheese to fully come to room temperature and enjoy its creamy texture with a fresh baguette, red grapes, figs and/or walnuts. Try Roaring 40's Blue with one of our wines through The International Wine of the Month Club, which offers excellent domestic and international wines—including some red and white from Australia. Check it out at www.winemonthclub.com.